Happy Friday, y'all! I have two farm photos to share and discuss with you today. Most of Tuesday morning was spent "working" dry cows and pregnant heifers. We walked the group from their pasture to the milking barn, sorted them into three smaller groups based upon their expected calving date, and then walked each group back to their respective pastures. When we are dealing with lots of animals (around 60 in this case) in close-by pastures, walking them down County Road 36 is much quicker than setting up a catch pen and hauling 6-8 at a time. So if you're ever driving by our place and see us moving them on down the road, just remember that the cows in your mirror are closer than they appear. The second "photo" is a video I shot while dumping a load of corn silage over into our truck. That process happened 113 times over the past ten days, and I'm glad to say that our first round of silage harvest is now complete. We will spend the first part of next week making some repairs and adjustments to the harvesting equipment, and I expect to be back in the field the week after that. I expect to repeat this scene at least another 85-90 times with the corn that remains, and then well over 100 once we start chopping sorghum a month from now. Y'all have a "dairy" good weekend! I uploaded my first farm videos to YouTube five years ago this week. I filmed and uploaded them from my very first "smartphone", a Nokia e71x, while harvesting hay. And while the video quality has definitely improved over the years, my goofiness and singing voice are still around the same level of awfulness as they always have been. So on this Throwback Thursday, I present my first YouTube videos. Try to enjoy! DGQ #1) Have you ever drank raw milk? Answer: I have, but not many times. There have been occasions in the past when I have collected a couple of quarts from our milk tank to either drink or make ice cream/milkshakes with. If I was to do that now, however, I would pasteurize it first. That would allow to me to keep the extra butterfat while removing potential harmful bacteria in the milk. Truth be told, though, it's a lot easier to buy milk at the store and add some half-and-half if I want to thicken it up. The safety of raw milk is one of the great debates within the dairy industry, as well as the argument over whether or not consumers should be able to purchase it if they so choose. I have felt relatively comfortable drinking raw milk from my farm because I spend so much time around my cows and are exposed to the same "bugs" that they are. But while I would figure our raw milk would be 99.99% safe for someone else to drink, the consequences of that 0.01% just don't make it worth it. Proper pasteurization provides a food safety aspect that far outweighs any perceived flavor or nutritional benefit gained from drinking raw milk. DGQ #2) Do your milking devices self-disconnect when cows are finished milking? Answer: Yes, our milking machines have automatic take-offs which turn off and disconnect the units when a cow finishes milking. In our system, each cow's milk passes through a chamber that contains a pendulum. As milk hits the pendulum, air in another small timing chamber is released. As the milk flow slows to the point it no longer moves the pendulum, the pressure in the timing chamber begins to increase. Once that pressure climbs to a certain level, it triggers a series of valves that first shut off that milking unit's suction and then pulls the unit off and away from the cow's udder. Until next time, thanks for reading and have a "dairy" good day! Happy Friday, y'all! I would like to talk a little bit about three photos I posted over the last few days on this week's edition of Farm Photo Friday. If you were keeping up with me on Twitter or Instagram this past Sunday night, you know I had a long evening. Armyworms had once again invaded our hay fields and required extermination as soon as the afternoon milking was finished. I was expecting to spend several hours in the tractor cab, so I ran home to change clothes and grab a couple of sandwiches my wife had packed for me. Later in the evening and well after sundown, my wife pulled into the hay field I was spraying and hand-delivered this cup of her homemade Milky Way ice cream. She had made it for the ice cream social that was to be held at church that evening, and wanted to make sure I got some. So the purpose of this photo is to mention the fact we had more armyworm problems, but more so to recognize my wife as being totally awesome! We have finally started seeing a lot of activity in our maternity pasture. I think we have had ten calves born this week, and that is just the tip of the iceberg of what's to come over the next couple of months. Despite all the fresh cows rejoining the milking herd, we are also drying off other cows at about the same rate. Our calvings vs dry offs should stay roughly equal for another couple of weeks, and then in September we will start to see our milking herd have a sustained increase. We started harvesting our corn this week, and hope to have 25 acres chopped and packed into the silage pit by the end of the day. You can see in this picture that the bottom half of the corn is starting to brown, both a sign of its maturity and the result of hot, dry weather. Most of our fields are sloped and terraced, and we have a good number of "short rows" to contend with (look just right of the tractor). We've avoided any major breakdowns up to this point, but we have a long, long way to go before this harvest season is over. 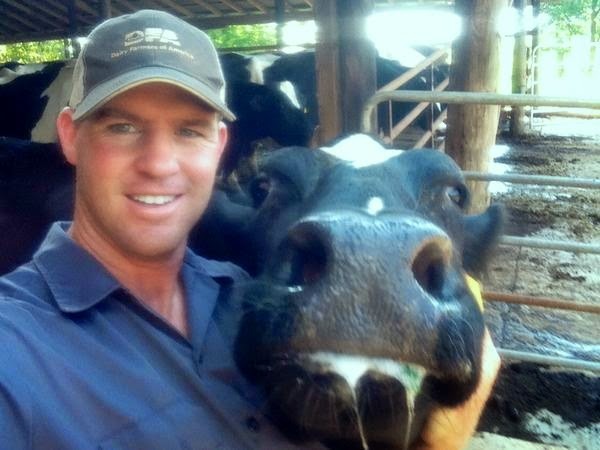 Answer: As a matter of fact, I do: Gilmer Dairy Farm cow number 859. She's big and tall, she's a good milker, she's as laid-back as a cow can be without being overly stubborn, and she never gives the first bit of trouble in the barn. She might not have strong idiosyncrasies like Ol' Number Seven had, but she does have her own spots where she prefers to stand in the barn and isn't shy about moving other cows out of "her" space. And unless she's on her way to eat, she always seems to appreciate a good head-rub. Answer: Some of the milk in your local grocery store is identified specifically by the amount of butterfat it contains, such as 1% and 2% milk. Skim milk contains only traces of butterfat (< 0.5%) or none at all. Whole/Vitamin D milk, on the other hand, often doesn't give a clear indication of its butterfat percentage on the label. The federal minimum butterfat percentage standard for pasteurized whole milk is 3.25%, and most of it retails at or just slightly above this percentage. Exceptions include whole milk sold in California (3.5% minimum) and some brands of "cream line", or non-homogenized, milk. And while you might not find the actual butterfat percentage listed on a jug of whole milk, its nutrition label will include the grams of fat per serving along with information about protein, calcium, vitamins, etc. My advice is to drink whichever bf% milk you enjoy the most and adjust the rest of your diet accordingly, but do take time to compare labels and choose one that fits best within your overall nutritional plan. That's all for this week, but please let me know if you have a "dairy good question" you would like to have answered in the future. You can leave your questions via the comments section on this post, tweet them to me at @gilmerdairy, or post it to our Facebook page. Thanks for reading!